Using interval training for weight loss is one of the smartest ideas. Why? Because it is a fabulous fat-burning workout (but NOT for the faint of heart)! Want to know how to do it? Read on to discover 8 types of exercising you can use for interval training. Before anything else, you should know that although you can do interval training regardless of your age, gender and physical condition, this is a challenging fitness program and you must consult your doctor before starting it. Are you asking, “What is interval training?“ One of the little-known workout hacks, interval training is the best exercise to burn fat – you’ll be impressed with the results! You will lose at least 2 pounds of pure body fat per week – with no water or muscle loss. Keep in mind, even though your weight goes down when you lose water or lean muscle mass (through low calorie dieting), this does NOTHING to help you achieve the trim and toned physique you want. That’s why interval training is, by far, the most efficient workout you can do to lose all that flabby fat and re-shape your body permanently – IF you do it correctly and give it your all. To make sure you do it right, check out these interval training tips. As you know, when doing cardio, your body burns fat only during the time you work out – and this only after the first 20 minutes it takes your body to start burning fat. As soon as you stop your regular cardio session, your body stops burning fat. In contrast, with interval training you start a powerful, long-lasting chain reaction in your body. Your stored fat is burnt as fuel to restore your body to its normal condition through a process called excess post-exercise oxygen consumption (EPOC). In other words, EPOC initiates a fat-burning process within your body that lasts up to 48 hours. Think about it. After a session of interval training of only 20 minutes, your body continues to burn fat for many hours even when you sit at work, drive your car or sleep. 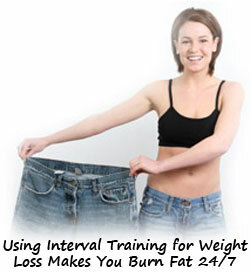 Are you motivated to get up and start doing interval training for weight loss? Another great thing is that the more you engage in interval training, the more efficient your body burns fat. You will see that the intensity of your interval training session is in direct relation to the amount of fat you burn and the duration of fat-burning processes in your body after the workout. Here are a few practical examples of how to design your interval training exercise for a 20 minutes session. Always remember to warm up before and cool down after the workout (3-5 minutes each). Outdoor Sprints: Sprint 10-30 seconds at near-maximum speed, then walk normally for 60 seconds, then sprint again and rest walking – for a total of 6-12 sprints. This is one of the best weight loss workouts of interval training. Treadmill Jogging: 5-minute moderate walk followed by a 3-minute intense jog, then 5-minute moderate walk again followed by 3-minute intense jog and back again ending with a normal pace. Jumping Jacks/Squats: Alternate 5-minute moderate walks with 3-minute intense jumping jacks (jumping squats or jumping rope). Body Weight Exercises: Start with squat jumps, move to calf jumps and stability ball jackknives and finish with Turkish get-ups. Or, use plyometric drills alternating between low-impact jumps and depth jumps. You can also progress from depth jumps to bounding exercises then down to low-impact throws again. Elliptical Machine: Alternate moderate and high-intensity bursts for about 2-3 minutes each. Also, utilize the various resistance settings and power inclines. Swimming: Offering a complete body workout, swimming is great as interval training for weight loss, as it requires greater exertion while not putting your joints under stress. Start by warming up for 3 minutes, then alternate the type of strokes you prefer at the fastest pace you can for about 30 seconds with easy strokes for 1 minute. Repeat 8 – 10 times. Rowing: Warm up with easy rowing for 3 minutes, then progress from a 10 hard strokes – 10 easy strokes cycle to 30 hard – 30 easy strokes. Work back, then start from the beginning 2 more times. Cycling: Ride short passages close to your maximum capacity then rest with easy cycling for 1-2 minutes and then back again. Any of these exercises will help you burn fat faster, tone your muscles, build longer endurance and get so energized like you haven’t been in ages! Plus, they’ll keep your motivation to exercise consistently for even greater results. Regardless of the type of interval training for weight loss you choose, remember to always stay safe. The most convenient interval training workout? Take a look at the interval training treadmill routine.